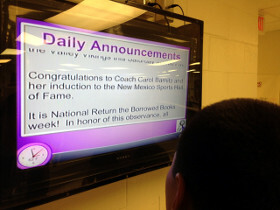 Albuquerque, N.M. - March 12, 2013 - Manzano High School has installed a digital signage system using StrandVision Digital Signage software. The system reaches students in six public areas and is also available in several classrooms across the campus. The electronic signage system also brings another dimension to student communications. Since it is a visual medium, it offers the opportunity to feature pictures of students at social and sporting events. It is also being used to promote signups for advanced placement classes and other electives such as photography, anthropology, art history and DECA, to name a few. Explained Ken Tuley, assistant principal and system administrator, "If kids don't have a class at the time of the daily announcements or they're not paying attention, they could miss the audio announcements. With digital signage the news is on the screens throughout the day, including lunch, so they have the opportunity to see them several times throughout the day." Using the existing cable system and a combination of old televisions and newer flat screens several public areas including lobbies, the snack bar and offices have digital signage displays. Teachers in classrooms are encouraged to turn on their televisions to display the digital signage between classes and during breaks. The system connects to StrandVision Digital Signage cloud servers over the Internet to display the announcements and to access additional services, such as local weather. The Internet-based signage system eliminates the need for costly onsite servers and networking gear. Contributors, including the activities director and other administrators, log on to the StrandVision website to add daily announcements and to post pictures. The new announcements are sent to the MacBook within minutes to update all of the electronic signs. "Manzano is an example of using old infrastructure to bring the latest technology to its students," said Mike Strand, StrandVision founder and CEO. "They took existing assets, the cable network, televisions and an old MacBook, and coupled it with the latest in cloud-based digital signage technology to deliver a new student communication medium at minimal cost. Manzano is a very cost-effective model for other schools to emulate in communicating with students and parents during these tight budget times." StrandVision LLC, based in Menomonie, Wis., delivers low-cost, Web-based digital signage software through a patented Software as a Service (SaaS) approach that delivers content to subscribers' LCD flat panel screens, as well as computer screens, websites and mobile devices. StrandVision's service distributes text and graphics pages, video content and national and local weather and news. It is ideal for many large and small business marketing applications, including medical and dental offices (patient education); banks, retailers and industrial distributors (video merchandising); education (student communication, staff and visitor information); employee break rooms (employee communication of events and benefits); nonprofit and religious organizations (member and supporter communication).